Standard Operating Procedures, or SOPs, are pretty essential to all businesses. Whether or not you’ve gone through the process of identifying and implementing systems, it goes without saying that there’s always some protocol in place. To get the desired result, you’re going to need more than a few effective stepping stones. 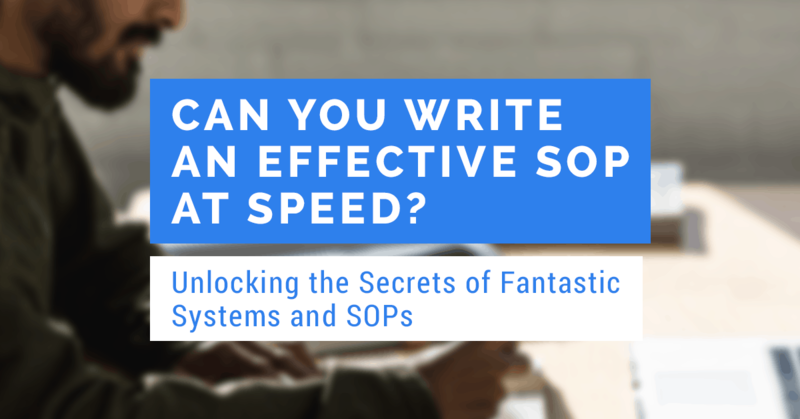 Writing SOPs during systems creation can be simple at times, and tricky at others. The main task for plenty of business owners and their teams is doing so at speed. Turning your business around with highly effective and focused SOPs can take more time than you bargain for. SYSTEMology® is not just focused on enhancing the efficiency of your operation. It’s focused on improving the efficiency of your working behaviour, too. Understanding the business process is, of course, part and parcel of writing the perfect SOP. It’s also just as much about working with the right expert and taking the right amount of knowledge to apply to your own critical flow. It’s all about taking on inspiration and working models and seeing which pieces fit where. You’re allowed to borrow and steal, sometimes – when it comes to creating the perfect systems skeleton. David Jenyns recently spoke on behalf of SYSTEMology® with regard to creating SOPs in a step-by-step manner. In this article, we’ll take a close look at what David feels are the essential roads you should be taking to reach efficient, effective SOPs. It’s not always a case of running with your own thoughts and ideas. So this planted an idea in my head. I thought this is a pretty good idea. So the solutions are already out there, people already know how to do it. I thought how can I match this? You’ll learn about positive constraints later. How can I do something that forces me to get the outcome that I want and I pass the point of no return? I like running a workshop here. Do you think having a workshop, knowing that 50 people are going to be turning up in the room, didn’t force me to make sure that this presentation and everything was super polished? It was a line in the sand. So I look for, where I can, these positive constraints that force me to do something. I decided to run the Business Systems Summit. I know that’s how Michael got to know me and some people may or may not have seen this. Basically I recognise that business is just a collection of systems. If I could identify experts in the different departments in their business and the brief to the speaker’s was basically I want you to share a system or a process that you use within your business that solves a specific problem. I picked all of the speakers. You can see sales, marketing, client fulfilment, human resources and basically put on a summit. It started at 30, very quickly ballooned to 40 experts. Each expert was sharing a system that they use in their business to solve a specific problem from their department. I then recorded the interview with them and then we did the extraction. So I gave it to my team, got them to document it and turned it into systems and processes. There was the knowledgeable person who knew how to do it and then there was the extractor. The end of it was, the people who attended the workshop got 40 documented systems that they could swipe and deploy in their business that were already three-quarters of the way there. Take the system, customise it, make it your own. Once you identify your Critical Client Flow, you know which pieces are missing. Some of the systems we’ll talk about a little bit later for scale, you then start to build your business together like Lego pieces. You think about what is the missing piece here? Where can I go to get that knowledge and then what’s the easiest way we can extract it? That’s really what informed me and moved me along to this idea. The big insight is that there are two people in this process. There’s the knowledge worker. It’s the person who does the task. Then there’s the extractor. You’ve already identified at least your primary owner, that knowledge worker and maybe your secondary owner. We just now need to make this as easy as we can for them. They’re busy; they don’t have time. Cain works in a company called Porter Vac, and they clean the gutters of people’s houses when leaves and stuff come in. So part of that process, there are field workers that go out into the field and hop up on the rooves and do all that they need to. In about a week or two we’re going to put a GoPro on Cain and send him out into the field with one of the field workers. He’s just going to walk behind the field worker and record it actually happening. The key is you capture it as it’s happening. You don’t look to over optimise it; you just record it. That’s what the record is. Sometimes if it’s on the phone. You might put a mobile phone next to the person who’s on the phone and record them taking the incoming call. You capture it and then that is a great way to then go to the documenter who can extract what’s actually happening. Then we document it, which is a separate person. Everybody likes to edit. No one likes to write from scratch. We can then do the extraction, give it to a documenter. They document it, then it goes back to the person who did the task, and then they review it. So it’s a pretty easy process. This pre extraction form is just what we give to people before they do it. So you already know what your systems are from the assign sheet, who’s doing what. Now you go to the person, so whoever you’ve identified knows that you give them that sheet and you say, I want you to fill out this before we do the recording. Just make sure they get the overview right, make sure that they think about what logins do I need, make them get the main bullet points down, just so they’re somewhat prepared. Again, you’re looking for, the system name, the department, how long you think the task would take? The key is the people already know how to do the thing anyway if you’ve identified the right person. You just want to make sure that we avoid the deer in the headlight situation. Oh gosh, I’m being recorded and then sometimes some people really struggle. You just capture them doing it. What the extractor does is they ask the questions as far as, that wasn’t clear. Why did you do this? Why did you click there? Cain and I have been doing a bit of work at the moment. We’ve got Christie; she’s been doing this particular step in the CCF for years. So she’ll just whip through it and fly, and she’s clicking here and clicking there, and I’m saying, what are we doing there? Why are we clicking there? That’s what the extractor does to try and just make sure that you capture what is done and ask the right questions. So there is a little bit of a skill there that will develop over time. But that’s what you’re looking at doing. You think objectively as a person who’s never done this task. I might understand the broad concept of it. But if I was to do this and try and replicate it, what would I need to know or do? The extractor has to be someone who’s curious in nature and someone who likes to learn and understand the way that lots of things work together. I find great extractors, are return to work Mum or Dads who are ex-corporate, coming back into work. They’ve got all that that heavy training, they understand business sometimes at a high level. They work incredibly well. The other ones that work well are ex-military. If you find someone who’s been in the Army Reserves or something like that and then they’re coming back, they can work really well as documenters. That’s what they do, and that’s what they’re trained for. We just need to think about then recording it. You just capture it in wherever it’s happening, with whatever mode. That could be screen capture video. We do things through Zoom. Sometimes I’ll do things through ScreenFlow. I think another one Snagit if you’re on PC, I think that works on both. Using the iPhone, get a GoPro, digital SLR, just whatever. You just record the thing happening and make it as easy for the person as possible. Then you move to the documentation. The system for creating systems shows you how to identify who knows how to do this thing, figure out how we’re going to extract it. There are two versions of that system for creating systems. Version 1 is very simple just the main bullet points. 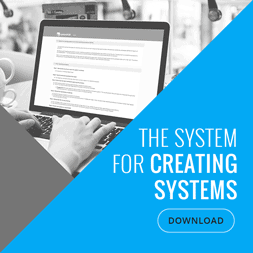 Then there’s a much more detailed, expanded version of the system for creating systems. The reason for the two is, when it comes to documentation, to understand that you might look at one of my completed systems and go, wow, there’s so much detail. There is so much work here. In version one, systems might start as simple as this just the main bullet points. Over time, you evolve it, and you add extra detail. When you go to train someone, they might have a question. You get the person to go back and tweak the system and improve it, so the question gets answered in the system. We just want to make sure that the on-ramp to getting this done is really low. I’m trying to set the bar for you so low. Bullet points are fine if that’s where you want to start. You just have to start the process. The first time you write a system or get a system written that is the worst it’ll ever be. Every time it will get better and better and better and better. The structure I try and keep relatively simple. You’ve got an overview at the top which explains what the system is about. Sometimes I put a flowchart in. I’m not a huge fan of flow charts. Occasionally, I’ll put it in. It depends on the task. If it’s a very complex system that’s got a lot of moving parts, sometimes a flow chart will just connect with the reader in a different way. They get an overview. Don’t start with the flow chart first though. Just start with the steps written down because they’ll change and adjust and things like that. You’ve got the steps, which is usually you’ve got the main step and then you might have some detail underneath those steps. Then you’ll have any supporting videos, documentation, email templates. At the end when I show you, the optimise, I’ll hop into Melbourne SEO Services. I’ve got all the tabs open. We’ll have a look in my Asana. I’ll show you the email templates. I just have to be really careful. I don’t want to, not that we’re McDonald’s, but we’ve been doing systems for a while so our systems will be quite well evolved. If you’re just starting out, I don’t want you to look at it and then get the deer in the headlights, thinking, oh well. I have to start there. Whereas you don’t, you start very simply just like that. That’s enough to get you moving. Then the proof review process, usually that’s when more detail comes in. So there’s always a secondary person as we talked about. You’ve got the primary owner. You’ve got the secondary owner. The secondary owner actually, that’s the other thing to mention with regards to the documenter. This can oftentimes be a different person. The extractor and the documenter can be the same person, or they can be even different. At this point, you’ve just got a recording of the task getting done. You want to get that recording now to someone who is going to do the documentation who is not the knowledgeable worker. That’s the hack. That’s the way to break through and get team members to document things where they’ve previously struggled. It is just have someone else do the documentation for them. That’s the breakthrough there, and then you just get them to review it. Usually the primary owner, then we’ll get the secondary owner to do it. So I’ll say great, now you do the particular task, you let me know where you get stuck. So Sally writes out a system for invoicing, and then we say, all right Jillian, can you run through the system now and then see if you can follow it? Then Sally knows if Jillian has questions, oh, wow, there must be a hole in the system. We’ve got to plug that piece. It’s always good to have two people in your business. You want to avoid single person dependency. The business owner is usually the worst single person dependent, but often it happens with staff as well. That happens often times as well where you think hey if let’s say, Jane, got hit by a bus. If Jane had all of that IP on her particular role and it wasn’t documented, now no one knows how to do that thing. You need someone to be able to step in and do it because the business machine must keep functioning. While it’s tempting, and probably beneficial at times, to go, ad hoc, it’s important to take notes. When building SOPs, systems and processes, it’s crucial to record things, to take stock. After all, without hard proof of what goes on, you’re only ever going to be working from memory. Effective, efficient and appropriate systems and SOP strategies arise from careful listening, notation and review. Thinking of this procedure as though you’re taking on a new part for a machine. You’re introducing a new system or process into your existing body to help it run faster, to offer more answers, to be more productive. Listening to and recording data from experts and others who use systems is much like shopping for ingredients for a recipe, or for parts for a car. There are thousands of great ideas and talented people out there – just pick the right ones to benefit your business and workflow. Writing an SOP shouldn’t be laborious. It shouldn’t be hurried, either. You can write and introduce SOPs and systems at any point in your business’ life cycle. Once you have the knack of taking inspiration and implementing it in the right way, you’ll be able to create your own fantastic working operation. It’s all about adding things in, piece by piece. How do you build your own SOPs? Please feel free to share your stories with us. SYSTEMology® will help you to understand all of the little parts that make up the greater whole. Building Procedures: Why Go It Alone? How Could Process Management Transform Your Business? 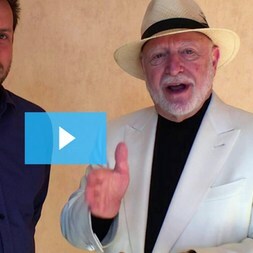 Building Your First Business Systems – Where Do You Start?